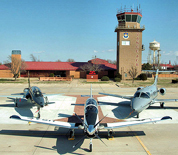 Vance AFB is located in Enid, Oklahoma, approximately 65 miles from Oklahoma City. The host unit on base is the 71st Flying Training Wing of the Air Education and Training Command. The 71st is responsible for training Air Force, Navy and Marine Corps pilots and preparing them for deployments. Vance is the USAF's only Joint Specialized Undergraduate Pilot Training base. Enid is the 9th largest city in Oklahoma and its culture is largely influenced by oil and agricultural commerce. Enid is home to the annual Tri-State Music Festival. This Vance AFB directory features the critical info you’ll need to navigate through the many facilities and recreational opportunities available on base.